Though it’s late in the season to get a boat in at Alum Creek, it didn’t seem to scare boaters away. 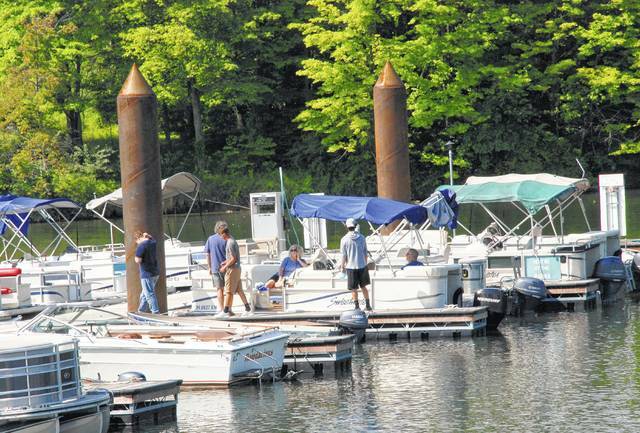 Mike Bailey, Ohio Department of Natural Resources chief of the Division of Parks and Watercraft, said the docks are at full capacity this year. Boaters were able to start putting into the water and tying up to spaces last week, Bailey said. Dying to get their oars into the water and push off from the new Alum Creek marina docks is a group from the Gladden Community House in Columbus. 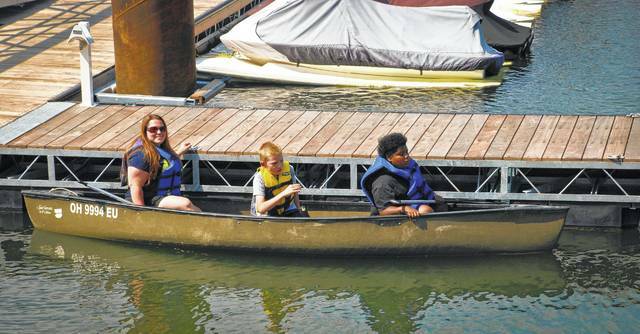 From left, Trisha Corns, Randall Sturtz, and Isaac Glover planned to canoe on Alum Creek the rest of Thursday morning after the ribbon cutting ceremony to officially open the docks. It’s anchors aweigh for boaters now that the docks at Alum Creek Marina are open. The $6 million renovation project delayed the season and prevented boaters from putting into their slips until June 21. However, the delay didn’t seem to scare anyone away this season. “Dock fees were prorated this season,” Mike Bailey, Ohio Department of Natural Resources chief of the Division of Parks and Watercraft, said Thursday during a ribbon-cutting ceremony to celebrate the completion of the project. “We’re at full capacity,” Bailey noted. Ohio Department Natural Resources Director James J. Zehringer said his agency has spent the last couple of years working to renovate Ohio’s parks. He said there have been many improvements beyond just the docks at Alum Creek. Bailey said the project was funded by the Waterway Safety Fund which is considered a “user pay and user benefit fund.” He said the fund is comprised of revenue from the state motor fuel tax and fees collected for watercraft titles, registrations, and dock rentals. Bailey said the new docks allow up to 240 boats with utility access for water, electric, a fuel pump station, and a waste pump station. He said the new docks are much longer than the docks that were replaced. Bailey said the docks aren’t just bigger, but they are also aesthetically pleasing. Both Zehringer and Bailey said all the improvements at Ohio’s parks is because of funds being reserved by the state. https://www.delgazette.com/wp-content/uploads/sites/40/2017/06/web1_DSC_3753_F.jpgThough it’s late in the season to get a boat in at Alum Creek, it didn’t seem to scare boaters away. Mike Bailey, Ohio Department of Natural Resources chief of the Division of Parks and Watercraft, said the docks are at full capacity this year. Boaters were able to start putting into the water and tying up to spaces last week, Bailey said. This entry was tagged Alum Creek, Boat Docks, delaware county, Ohio Division of Natural Resources. Bookmark the permalink.